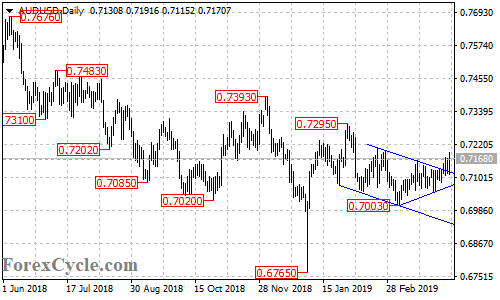 AUDUSD broke above the falling price channel on the daily chart, suggesting that the downside movement from 0.7295 had completed at 0.7003 already. Further rally could be expected in a couple of weeks and next target would be at 0.7300 area. Support is located at the rising trend line, only a breakdown below this trend line could trigger another fall towards 0.6950.